Yiwu is not a coastal city, but they’re building an inland port. Yiwu inland port station is one of the main Yiwu projects that recently completed. It covers an area of 394 mus, building area of 43,000 square meters; annual throughput reaches 600,000 standard containers. I can accommodate 14,500 to 16,500 freight vehicles come in and go out. Customs clearance, inspection, shipping, freight forwarding will all be installed inside as an one-stop comprehensive logistics services. Above facilities and service will be put into use by end of 2011.Above numbers are for “Yiwu Port” phase one. When its second phase completes, this inland port’s annual cargo throughput will reach 1.1 million TEUs. In October 2011, the city council will be set up in the inland port of 12,000 square meters of office space and the clearance, 12 inspection platforms, and 100 staff stationed. There will be an investment 3.8 million yuan to establish quarantine laboratory. Logistics and distribution center of domestic commodities, commodity export control center a project at full capacity; further innovation "customs clearance" operation mechanism to facilitate customs clearance and import and export of goods and convenient mechanism for building ports and other electronic information platform; for opening the "Yiwu Hong Kong" through customs, and built with the set of sparse, storage, packaging, cargo handling, distribution and other integrated functionsof origin and port of destination. Yiwu International Trade by comprehensive reform pilot in the east, Yiwu Exit Inspection and Quarantine also boldly explored the future of reform. Full use of inland ports, based on the station platform, the council attempts to explore the export market, purchasing a new mode of regulation. It is reported that the council will monitor the implementation of centralized procurement of goods market, closed management, set out in the inland port card port and inspection platforms, to carry out port inspection of commodities "into the zone declaration, classification regulation, a single inspection, bayonet release "The port control mode of operation. Regulatory means to further innovation, the implementation of pre-storage products, packing inspection, audit clearance, improve test efficiency; customs formalities to increase the container number information, to facilitate the release than the bayonet, improve customs clearance efficiency. 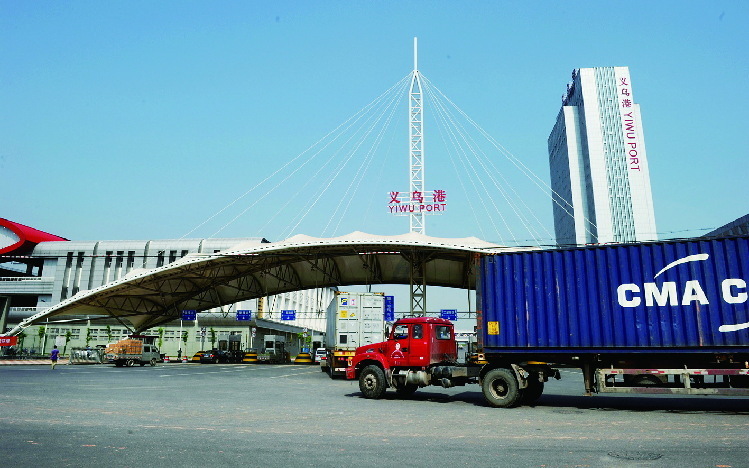 In addition to fully cooperate with the Yiwu logistics Heights and the "Yiwu Hong Kong" building, Yiwu Exit Inspection and Quarantine also actively involved in local government-led local e-port construction, and promote information sharing and exchange, the establishment of port logistics information exchange system, the "one document for both, a machine dual, dual instruction release "mechanism for exploration and research. Yiwu Exit Inspection and Quarantine, the official said, the new regulatory model, compared with the existing regulatory approach, for effective supervision and improve the clearance rate has an important significance. Office for Rent in Yiwu! Having A Company In Yiwu Is Becoming Easier. Yiwu Is Protecting Intellectual Property. Air China Flies from Beijing to Yiwu Directly. Yiwu Port is Taking Shape. Hong Kong to Yiwu flights 2011. Yiwu Becomes 10th Special Economic Zone in China. New Exhibitions Are on the Way in Yiwu. Labor Shortage after Chinese New Year Holiday in Yiwu China. Total Foreign Companies in Yiwu Reached 3,008 by 2010. Yiwu Manufactures Attended 63 World Top Exhibitions in 2010. Low temperature affects Yiwu electricity power supply. Yiwu Sells Over 17 Million USD Products Each Day. Yiwu GDP Reached 4 Billion USD after Q2, 2010. Brazil-China Commerce Association Visited Yiwu for Invest Opportunities. Mayor of Parramatta, Australia Visited Yiwu.